Illustration by Chris Tomlin; reprinted with permission of HarperCollins UK. HarperCollins UK kindly allowed MWDTSA to print a black and white version of this coloring page for use in elementary school visits. 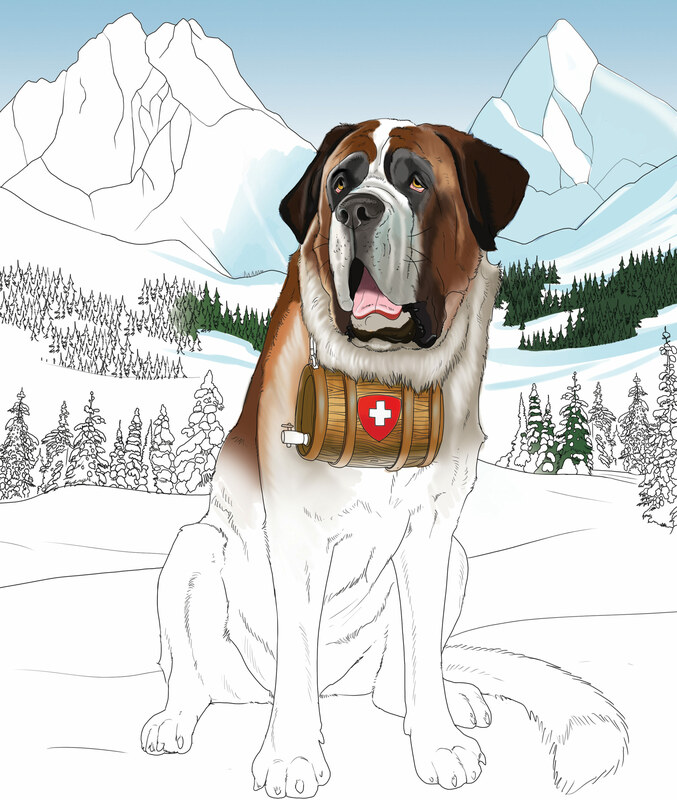 Check out Tomlin’s amazing coloring book: Art for Mindfulness DOGS. Source: Camp Hale Ski-Zette (Pando, CO), 21 April 1943. Colorado Historic Newspapers Collection. CO State Library. I can just see you frisking around and barking, Goody! A letter from Puppa from Pando! Well, Woof, Woof, here I am, safe and sound in the Rockies. It was quite a trip. The train mushed up through the Royal Gorge and Salida and Cañon City. Some of the curves were so sharp the train could almost bite its tail. The scenery reminds me of the Alps that your grandfather is always talking about. I never saw an Alp, but I don’t think they could be much higher than these Rockies. We’re on the top of the world, two miles straight up in the air. It keeps snowing all the time. They say there’s twenty feet of snow in this place, but I don’t know; when there gets to be twenty feet of it in a place, there isn’t any place. Icicles hang from the roofs to the company street, taller than men. And is it cold? Below zero! First thing when I got here, I went over to Headquarters to make out a questionnaire. This is a mountain artillery outfit and they have a lot of mules, but I never cared much for mules. Even from a distance they smell, and close up they kick. This bunch are guaranteed to kick from any angle and at any range. And they do. They can go up the mountain trails where the jeeps can’t, but I can go up where the mules can’t, on account of us being Alpine stock. The first night, they put me in a pup tent. Can you imagine? Me! In the morning, I forgot where I was when I woke up. I stretched, and the whole tent came down on top of me. A rookie was going down the company street and I ran after him to help me out, but he gave one look . . . and ran faster. Tonight they’re going to put me some place else. Maybe in the dog house. That’s a place I keep hearing about, but I haven’t been able to locate it yet. Somebody’s always in it. I’m all mixed up. They say I’m the first dog here, but the men are always talking about their dogs, their dogs are tired, their dogs hurt them. Still, I didn’t see any dogs. Once I heard talk of bones. I listened because I don’t know what to do with mine. The ground is so hard I can’t bury them. But here it seems they roll the bones. They talk about chow. That sounds like a dog and isn’t. Yesterday they had hot dogs for chow. And they say I’m a guinea pig. They’re experimenting, and if I turn out to be useful in the war effort with these ski troops, they’ll train a lot of us. That’s being a guinea pig. There’s a lot to learn about this Army language. The sergeant got sore. “Pipe down, you guys,” he barked. The men have big white capes with hoods to wear over their uniforms. They call it snow camouflage. It makes them look funny, like big Russian wolfhounds standing on their hind legs. I didn’t get in on that issue. They say I’m snow camouflaged already with my white coat. Only the brown spots have them a little worried. Well, be good and eat your kennel ration before they start to ration kennel ration. Remember, one of these days you’ll have to do your bite. p.s. I didn’t have to go to the delousing plant. It’s so cold here fleas freeze…tell Mama. 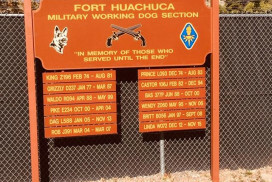 Inspired by Bruno’s tale above, MWDTSA would love to read dog’s eye stories from present-day handlers. Seventy-five years from now, someone might be reading your piece to glean insights about military life in 2018. To submit a dog’s eye story or poem for MWDTSA’s blog, email Nikki Rohrig (president@mwdtsa.org). 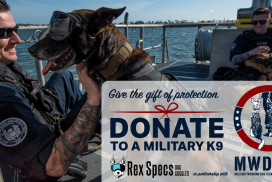 To learn how you can support military working dog teams deployed in conflict zones overseas, visit https://mwdtsa.org/.